Sometimes there’s a tendency to take for granted the things right around us. And that’s a mistake. A walk along a deserted stretch of beach never disappoints. The same was true of a visit to the gallery of beloved local folk artist Woodie Long. For anyone who stepped through the bright-red screen doors that beckoned first-time guests and old friends alike, a visit with Woodie and his wife, Dot, was sure to be memorable. They were there to guide serious buyers as well as inquisitive browsers around their gallery. But most of all, Woodie always found time for the children who came to the gallery, inviting kids of all ages to gather around a pint-sized table to sketch and then exchange works of art. It was impossible not to immediately feel like an old friend. Woodie was gregarious, gracious, accessible, and ready to laugh or tell a joke. Woodie had a way of making everyone feel relaxed and comfortable with him and his art. So comfortable, in fact, that people tended to forget Woodie’s stature in the international art world. His paintings are held by hundreds of premier art collectors and displayed in scores of museums. During his career, Woodie was featured in Smithsonian magazine, the New York Times, Southern Living, the Washington Post, and countless regional magazines and newspapers. Sadly, Woodie passed away on October 12, 2009, a week shy of his sixty-seventh birthday and a little more than a month before a retrospective exhibition that opened in Seaside on November 21 and ran through January 31. Hundreds of friends, family, and art lovers attended a reception to honor Woodie’s creative legacy, to remember his love of life, and to rejoice in his favorite things—music, laughter, stories, art, and chocolate cake. Musician friends from all over came together to play the “pickin’-and-grinnin’” style that Woodie loved dearly. Although the long-discussed exhibition did not come to fruition before his passing, Woodie knew it was in the works. Seaside town founders, Robert and Daryl Davis, and Eileen met with Woodie and Dot a few days before he died and talked about an exhibition. “After we left, Robert said we needed to do this show ‘no matter what happens,’” Eileen recalls. The town of Seaside was among Woodie’s early supporters, so it was fitting that the exhibition would be hung in an impressive loft-style retail space in the Lyceum Gateway Building, generously provided by Seaside homeowners Lisa and Bob Nesbitt, and Crissy and Bill Haslam. “Woodie and Dot came to Seaside in early 1989, and they convinced me to let Woodie have an art show in Pizitz,” recalls Erica Gibson-Pierce, manager of the Seaside Associated Stores. Although Erica was skeptical at first, she let them set up on the sidewalk in front of the store. They sold nearly a dozen paintings. “Our friendship just continued to grow from that point on,” adds Erica. 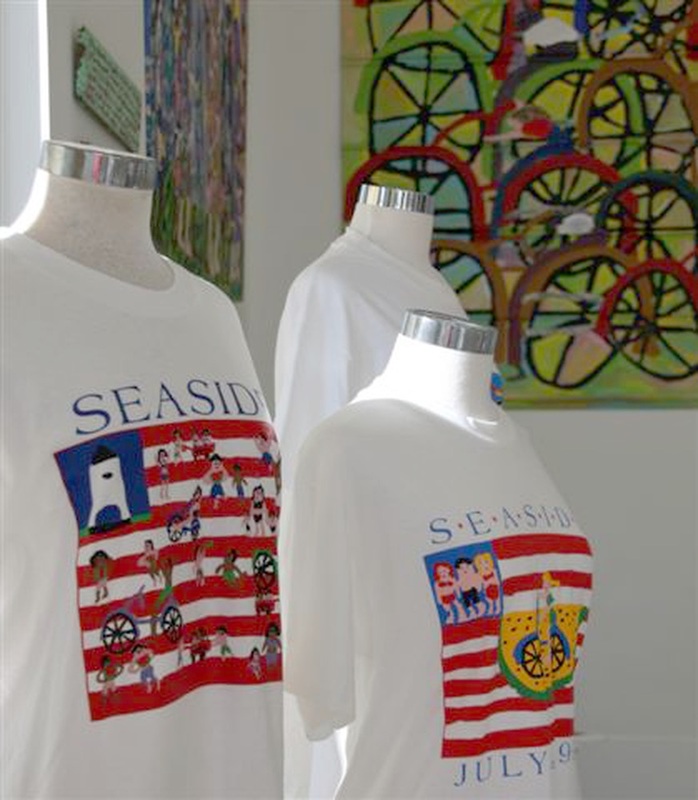 “Woodie was so generous and always ‘bribed’ us with art or items from his garden.” Seaside soon commissioned Woodie to create a special Labor Day T-shirt. It was so popular, that it became an annual tradition to release new T-shirt designs for Christmas and for the Fourth of July. This recognition by the stores of Seaside and the friendship of Daryl, Robert, and Erica prompted Woodie to get back to his Florida roots. In 1997, Woodie and Dot bought a former woodworking shop on Bay Drive just north of Highway 98 and converted it into their home, studio, and the Woodie Long Folk Art Gallery. Like many artists, Woodie was self-taught and spent much of his life doing something else before discovering his calling. Woodie was born in Plant City, Florida, in 1942 to a sharecropper family of twelve children who worked the fields together. When he was a youngster, his family moved repeatedly, and Woodie often missed school. For more than two decades, Woodie earned a modest income painting houses. In the late 1980s, while living in Andalusia, Alabama, job-related injuries forced him to take a break from his work. 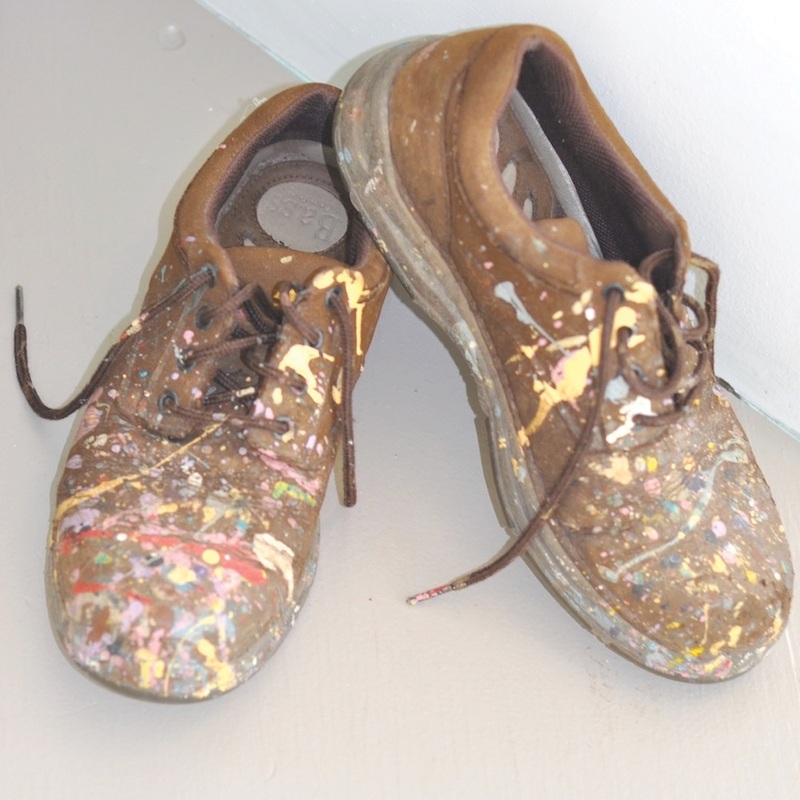 Dot was studying art at the local junior college at the time, and once he picked up one of her brushes, he immediately embraced his artistic mission. Unrestrained by rules or conventions, Woodie used lyrical figures, fluid compositions, and vibrant colors to give an identity and exuberance to his work. Many of the paintings that were on view evoke a rapidly vanishing rural life and reveal his bittersweet personal history. Some of the exhibited works are painted narratives retelling poignant episodes of Woodie’s growing up in a time and a place that seem a million miles away from today’s coastal communities along 30A. Spanning Woodie’s life, there were more than forty paintings in the exhibition, including some of his earliest works and two large pieces he painted last spring. Culled from Dot’s vast private collection, many of the items had never been publicly exhibited before this show. The show also featured an array of painted utilitarian objects—a wooden footlocker, tea kettles, a quilt, a pillow, and a single-bed headboard. In a sunny corner of the gallery, a painted cow appeared to have wandered into the show. Woodie painted the life-size figure at the request of Karen and Jack Holland for the CowParade event in Kansas City, Missouri. 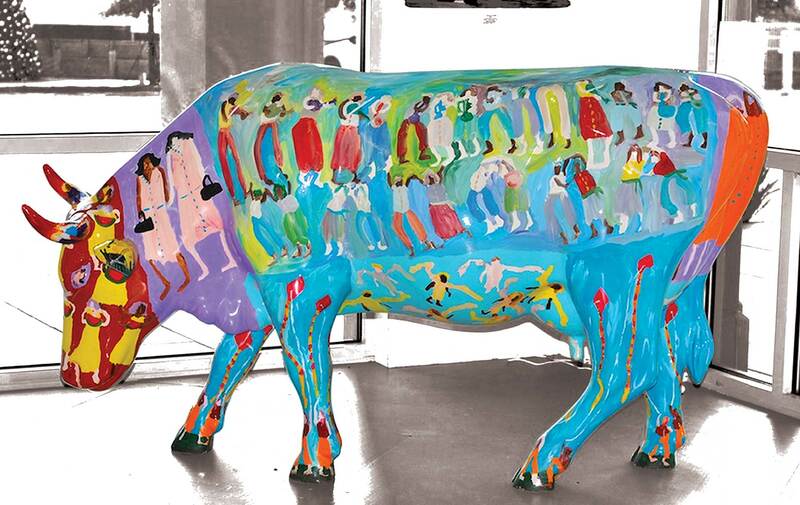 The painted cow was purchased by the couple and now grazes behind their Seaside home. Whether Woodie was painting on metal, canvas, plywood or paper, memories take form and one senses their vitality in an extraordinary play of color. A childlike innocence springs to life through the bold and confident strokes of his brush: boys pile in the back of a red pickup truck; girls savor slices of watermelon; flowers blossom in rainbow colors; field hands pick cotton; yellow cabs and pedestrians traverse New York with its skyline as a backdrop; musicians blow horns and strum banjoes. “Woodie never said good-bye when anyone left the gallery,” Eileen fondly recalls. “He always said, ‘I love you.’ So no one ever had to say good-bye to Woodie.” The community support that came together to create the retrospective exhibit and spirit of the reception reflects that same philosophy.